Greyhound ordered 60 new X3-45 motorcoaches from Prevost, extending a partnership that has been in place since 2007. 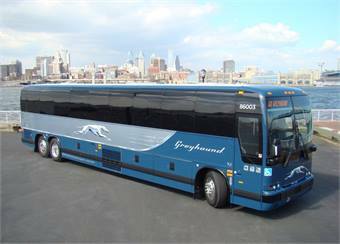 The coaches have been designed to meet the demanding needs of Greyhound and their customers, according to Prevost. “Greyhound and Prevost share a commitment to providing safe, efficient transportation to passengers across North America. The combined efforts of these two industry leading organizations will be a significant benefit to the transportation industry for the foreseeable future,” said Gaetan Bolduc, Prevost’s CEO. The 60 X3-45 coaches are equipped with features that advance Prevost’s commitment to safety, including Prevost AWARE, which includes adaptive cruise braking, following distance alerts and stationary object alerts, providing timely information to the driver and encouraging good driving habits. Other Prevost safety features include the Prevost Electronic Stability Program, the Beru tire pressure monitoring system and the Automatic Fire Suppression System. The coaches also boast dual 1800 watt inverters, powering 110-volt outlets and Wi-Fi Internet access throughout the coach cabin for each passenger. Additional highlights include an Aesys electronic destination sign and Prevost’s exclusive Swap & Plug wheelchair lift, as well as Volvo D13 EPA 2010 engines. Delivery of the X3-45 coaches is scheduled to begin in June 2012 and be completed in October 2012.